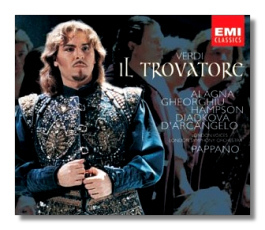 According to the cliché, all Trovatore needs is four of the greatest singers in the world. I won't be so foolish as to assert that that's what it gets here. Nevertheless, here's a Trovatore that's mostly well sung and dramatically intense, and those reasons are enough to command attention in a crowded market. Gheorghiu's warm, creamy voice has the proper weight and color for Leonora, although she has difficulty loosening up for the coloratura of "Di tale amor" in Act One. By the time Act Four rolls around, she is at white heat, and her duets with Hampson are electrifying. Like Leontyne Price, the great Leonora of the previous generation, Gheorghiu emphasizes her character's aristocratic nature. Husband Roberto Alagna also finds Manrico a sympathetic role; his proclivity to force and oversing isn't really a liability here, except perhaps for the long-term health of his voice. Lachrymose and hot-headed, he sings like he's the star of the show, and I suppose he is – EMI has put his picture on the slipcase cover, and the booklet contains an interview on his interpretation of the role. His long-held high C at the end of "Di quella pira" – more daring than finished – is a great show of ego. While Hampson lacks some of the warmth and amplitude of the great baritones – he is a little dry of voice here – his intelligence, and the monomaniacal anger that he gives to the Count make this a strong portrayal. Finally, to complete the quartet, Diadkova's Azucena is harsh, obsessed, and frightening – no weak old woman, this, but a woman still young and strong enough to play a central role in the opera's drama. Her use of the chest voice (and her wobble – not yet a liability) is rather Callas-like, making me wonder what it would have been like if latter-day Callas, as vocal infirmities overtook her, had sung Azucena. Mention should also be made of D'Arcangelo's Ferrando, no mere spear-carrier but a palpable character, impressively sung. Pappano reminds us of the opera's Spanish settings with rhythms that snap like castanets. While he doesn't do anything idiosyncratic, this is no "autopilot" Trovatore hampered by "this is the way it's always been done" routine. For example, one really shivers and feels the soldiers' fear during the opening scene, and their swagger in Act Three. In a modest way, Pappano shows it's not just the singers who must take responsibility for an effective Trovatore. The score is given complete (except for the Parisian ballet, of course). This recording was made in London's Abbey Road Studios. The engineering is spectacular but perhaps favors the singers unduly.